Voted one of the best real estate agents in DC by the Washington City Paper Readers’ Choice Poll in 2009, hipchickindc aka the not-so-hip Suzanne Des Marais is the Principal Broker (DC) for Urban Pace, LLC. She lives (and sells a lot of houses) in Bloomingdale, but works all over DC, with everyone from first time buyers to highly regarded developers. Unless specifically noted, neither she nor the company that she is affiliated with represented any of the parties or were directly involved in the transaction reported below. Unless otherwise noted, the source of information is Metropolitan Regional Information Systems (MRIS), which is the local multiple listing system. Information is deemed reliable but not guaranteed. 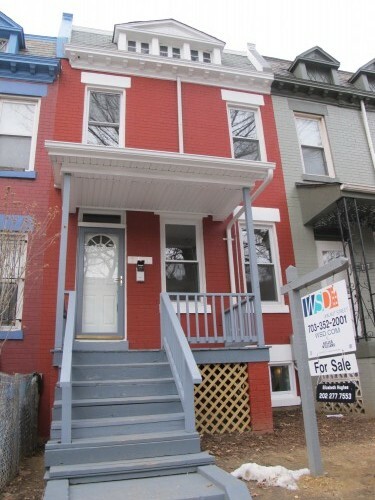 List Price at Contract: $349,900. Original Good Deal or Not post is: here. The listing can be seen: here. To see pics, open the listing link, click on the listing then scroll through from the main pic. This home is located between Sherman Ave NW and Georgia Ave NW on Harvard St NW, a primary eastbound route connecting NW DC to the major medical centers above the McMillan Reservoir. Built during the early 20th century (DC public records date these properties in the 1908-1913 range), these modest brick rowhomes typically have two to three bedrooms and relatively small lot sizes of 800 to 1000 square feet. Lots on the even side of the street are slightly larger than the odd numbered homes. Most homes on this block do not have offstreet parking. There was discussion on the original Good Deal or Not (GDoN) post regarding speculation on criminal activity in the area, displacement of prior residents, gentrification, etc. While I don’t have any interest in getting involved in a debate regarding any of these issues, the sales activity on this block reflects trends seen in many downtown neighborhoods. The bottom line is that the statistics show significant change in ownership over the past decade, for which some detail is presented below. There are a total of 77 properties on this block. Since April 2006, a total of 24 homes, or nearly 1/3 on that block, have transferred ownership (re-sales of the same address within a short time period were counted as one transfer since it is assumed that those properties were renovated by investors and re-sold to owner occupying buyers). A similar number sold in the previous five years. Of the 26 homes sold on the block between 2001 and 2006, 7 were re-sold during the proceeding five years. Ultimately, well over half of the homes on this block alone have different owners than they did ten years ago. Of the 77 properties on the block, currently DC public records identify 19 as non-owner occupied (presumed tenanted , vacant, or commercial use). Dear PoP – Props to the Cops (Vol. 7 and 8) and a Nameless Hero!